The Quick Sylver collection of PTƟ Primordial Mathematics has been published today. 44+ e-publications on more than 7.882 Mb full colour, at Gum road. 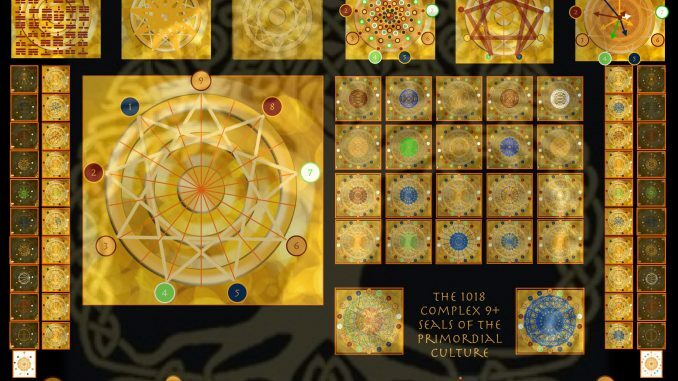 PTƟ Primordial Mathematics has been developed by the study of DNA Generation algorithms, nature laws, principles, rhythms, cycles, human potential (nature stages of development) and nature inspired knowledge and technology of ancient cultures and civilizations. Its most essential foundation focus on the study of geometrical values, pure mathematics and a form of vectorial mathematics. Its study and tools developed by application of PTƟ Primordial Mathematics are suitable for nonary computing, A.I., for example. One of the main set of tools developed by the researcher and author is one utilized for the systemic perception, organization and management of human, artificial and natural phenomena. Applications of these tool are in the field of strategic management, coaching, self-management, education, research, technology innovation, change management, leadership, governance. The author has developed as well applications for economy, gamification, social management, organization design based on PTƟ Primordial Mathematics. Advanced research is at the date organized in fields neuroscience, hormonal influences on human behavior, cyber-security, defense, life span, immunology and human potential. Applications have been developed in the research of archetypes, music, arts, health (burnout prevention), martial arts, yoga, meditation, self-management, self-knowledge. PTƟ Primordial Mathematics have as well applications in fields of quantification of value, know how, human capital, organizational performance, sustainable development. For example assessment in field SDG 2030. The 44+ publications will introduce the reader to the several fields of application of PTƟ Primordial Mathematics.